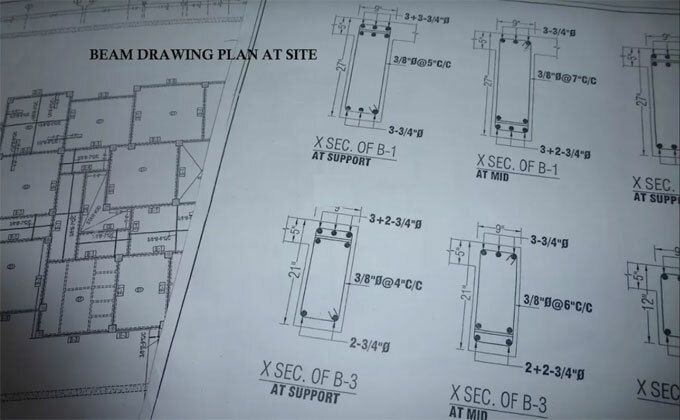 In this construction video tutorial, you will be familiar with the process to read the construction drawing plans for beams at the construction site. You can learn what type of bars should be applied in various beams (diameter) as well as what is flange and web of the beam. It is very crucial to all the newbie civil engineers to correctly understand it as while going to supervise the work at site it becomes essential to understand the entire drawing properly at site. In the video, X-sections of all the beams are provided. All the beams are situated at column to column. Flange means a spirally extended collar or rim on an object for placing or supporting it or for affixing it to another object. The actual width of the flange refers to the spacing of the beam. In a flanged beam, a part of the width under the actual width, is effective to be treated as a part of the beam. The web refers to the midpoint of the cross-section of a beam or girder. The web withstands shear forces, whereas the flanges withstand most of the bending moment experienced by the beam. To learn the complete process how to read construction drawing plans for beam. Go through the following video tutorial.